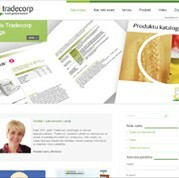 The new website brings the ease of the corporate website to Latvia, providing information adapted to their market in their own language.The new website features the same look and functions as the main corporate website, its dynamic design allowing for easy navigation and user satisfaction. Its responsive design responds to screen size, making it compatible with use on any device. Further, information on the site can be easily located with the use of the powerful search engine bar and tags that help to group related information. The RSS system also allows the Latvian community to stay up to date with all of the newest Tradecorp news.